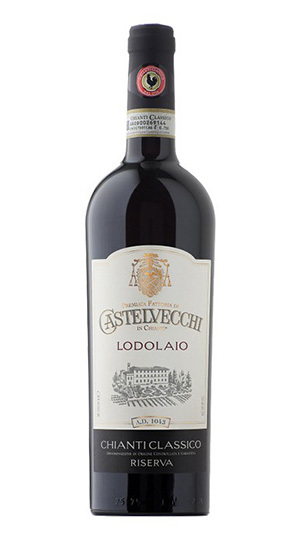 Chianti Classico Riserva Lodolaio 2012 – Score 88 in Wine Enthusiast wine magazine (USA): “Aromas of baked plum, coconut and roasted coffee bean lead the nose. The palate offers dried black cherry, vanilla, toast and a confectionary note alongside good tannins”. to maximize the ripening of the bunches. Maceration lasts for more than 30 days. The wine, after a first decanting, refines for 12 months in new barrique. After two years in the cellar, it is then bottled and refines for another year in a bottle before being ready for sale. Bright red color with purple reflections. Fresh scent, complex with intense fruit reminiscent of the scents of red berry fruit such as cherry, currants, blackberry and raspberry. The spicy notes lead back to licorice, cloves, cinnamon, pepper and dark chocolate with a vanilla finish. The taste is warm and enveloping with elegant tannins. Elegant Bouquet. Wine of great balance, meditation. Indicated to accompany dishes of red meat braised or cooked and game.